If you don’t want cookie-cutter decor, consider a xerographica. Also known as the Queen of Air Plants, the xerographica is a favorite stand-alone air plant as well as a high impact plant in floral displays. This beauty can be found everywhere from bridal bouquets to centerpieces. Xerographica is Greek for (xeros) dry, and (graphica) writing. An apt description for a xeric, or desert variety air plant whose long leaves echo elegant handwriting. Although drought tolerant, this air plant is also hard to over water. Provided that the plant is allowed to thoroughly dry upside-down before returning to its display. Unlike most air plants, the xerographica can handle direct sun. Doing so will cause its stiff, silvery leaves to blush pink. While the xerogphica is slow to bloom, it’s bloom tract can last over a year and be over a foot in length. After blooming, a single pup, or baby xerographica, will form at the base of the mother plant. You’ve hit gold if your looking for a large, stand-alone air plant. 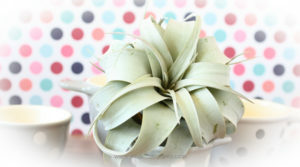 Click the amazon.com affiliate link below to purchase T. xerographica. For a compact version, check out the adorable mini xerographicas. Click the amazon.com affiliate link below to purchase T. xerographica mini.